It’s a decent enough cover, but I’m really surprised that DC didn’t get Brian Bolland to do it. If I think “Wonder Woman in the 1990s”, I think Brian Bolland covers… espeicially with William Messner-Loebs writing the book and Paris Cullins on art. Though to be fair, when I think “Wonder Woman in the 1980s”, I think George Perez, so me and DC weren’t on the same page there either. But yeah, it’s a decent cover. I think Wonder Woman is holding the lasso at the wrong spot, though… she appears to be holding the loop instead of whatever you call the rest of the lasso. Regardless, DC Retroactive: Wonder Woman – The 90s is on sale August 17th. Lord knows why anyone would want to revisit comics in the 1990s, much less put out six of them, but I don’t run DC Comics. The 90s may have sucked, but I’m getting the book anyway… it could be fun!! 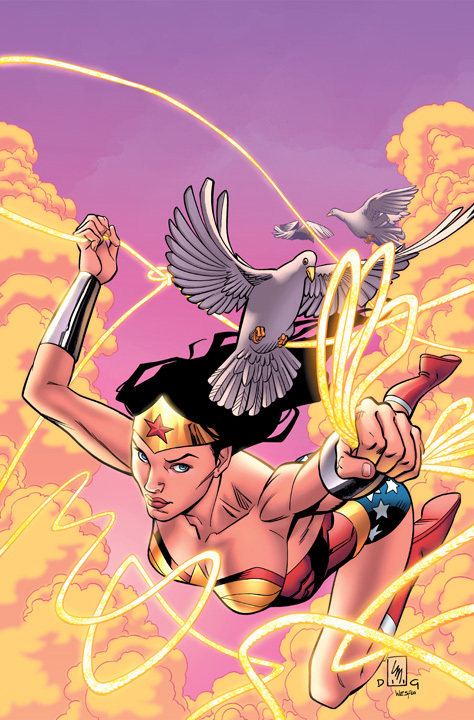 This entry was posted on July 5, 2011 at 6:30 pm and is filed under Comics, WW Comics. You can follow any responses to this entry through the RSS 2.0 feed. You can leave a response, or trackback from your own site.